Pioneer have unveiled the NavGate HUD system which uses a DLP projector to display vital navigation information onto the windscreen creating the illusion that the screen is floating in front of the driver. 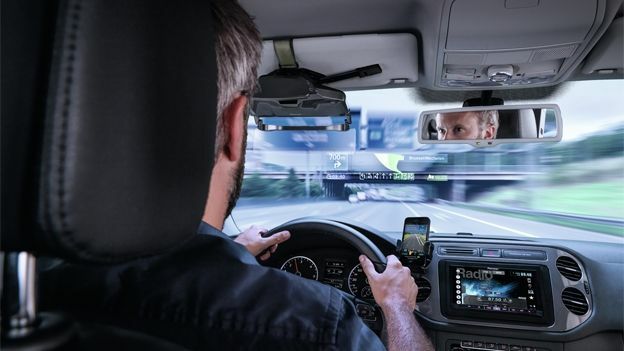 The new system uses a Digital Light Processor Projector to create an equivalent 30-inch display and when connected to CoPilot and NNG's iGO primo smartphone apps it'll display navigation information, upcoming hazards and show points of interest. Positioned just above the horizon the UI has been designed to be as low-distraction as possible whilst still being completely accessible and thanks to a built-in light sensor NavGate will adjust depending on the light outside saving power consumption and also making sure you can see even in direct sunlight. Users with the Co Pilot app will be able to activate HUD functionality through an in-app purchase, then once connected via USB, the smartphone will relay all the information to the HUD with voice commands being relayed through either the smartphone or through the car via Bluetooth. Costing £599.99 when it lands in October the NavGate is by no means the cheapest sat nav solution but it's certainly the coolest.